Imagine a canvas called the Great Plains, comprised of gently rolling green hills with splashes of colorful wildflowers. Picture languid waterways, rich with trout and other aquatic life, traversing unbroken landscapes that in turn also serve as highways for large herds of antelope and elk. Now, turn your attention to the sounds of the prairie: winds whispering through tussocks of grass, the trill of chorus frogs and the snorts of cattle and bison, all bound together by the songs of grassland birds. North America’s last great grasslands simultaneously announce their presence with both a mighty voice and an immense, pressing silence. Unfortunately, in some areas of the Great Plains, this soundscape has changed. Notably missing from the chorus are many of the grassland birds that are native to this region. 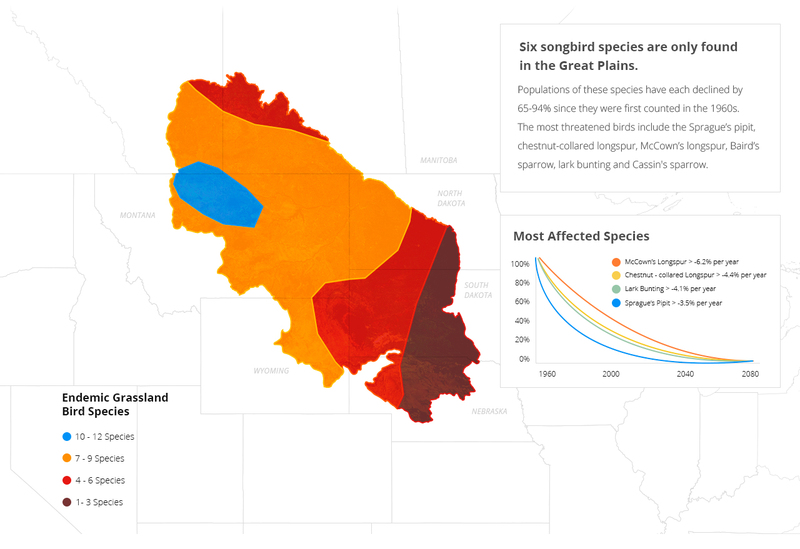 According to the 2017 edition of WWF’s Plowprint Report, populations of six songbirds that are only found in the Great Plains have declined by as much as 94% since the 1960s. Sprague’s pipits, chestnut-collared longspurs, McCown’s longspurs, Baird’s sparrows, Cassin’s sparrows and lark buntings continue to become increasingly scarce year-over-year. So what’s the cause for this worrying trend? The primary culprit seems to be grasslands loss—dwindling habitat—in the form of plow-up for row crop agriculture. From 2015 to 2016 alone, an estimated 2.5 million acres of grasslands were plowed up. In total, since 2009, more than 53 million acres—an area the size of Kansas—has been plowed or developed. Slowing conversion of these vital landscapes to other uses depends on recognizing the many values that grasslands provide for people, their communities, and wildlife such as grassland songbirds. If we are to be successful, it will take a multi-dimensional approach, in concert with producers and industry, but it can be done. WWF is dedicated to eliminating the spread of grasslands loss in the Northern Great Plains by 2030, which is home to some of the best remaining tracts of grasslands in North America. Policy makers to better protect and restore grasslands by fostering solutions for working agricultural lands that improve wildlife habitat. Producers and supply chains to integrate and incentivize improved stewardship and conservation of grassland in food and energy production. Companies on sustainable sourcing commitments and programs that protect sensitive habitats.